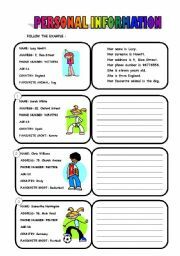 This worksheet is useful to revise question words and daily actions. 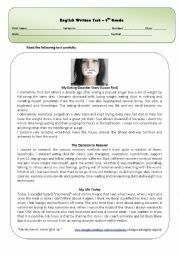 This is a test I´ve made about eating disorders. The grammar part focuses on Conditional Sentences Type 1 and 2. 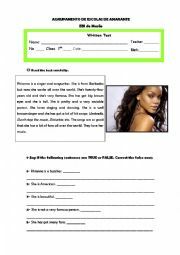 I made this worksheet for my 5th grade students in order to teach them how to write a small text about people using personal information. 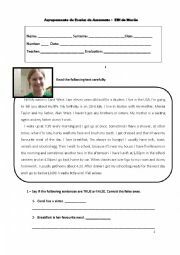 Students look at an "Identity Card" and write a small text.The worksheet has two pages. 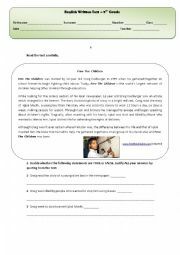 I took this text from a textbook but created most of the exercises by myself.It´s a test on the topic child labour but it also aims some vocabulary on the topic racism. The grammar points in the test are the present perfect and connectors. It is a very easy worksheet to introduce / revise hobbies. Students have to lable the pictures. This is a test on the topic house. Reading/Comprehensions exercises, vocabulary on the house/furniture, prepositions of place/time and there to be. I hope it´s useful. This is an easy test on the topic Daily Routine and th e Present Simple. 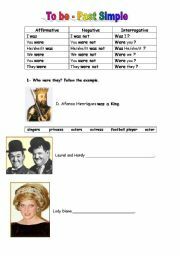 A worksheet on the past simple of the verb to be using famous people and their jobs. Reading / Comprehension on some information about Brad Pitt. Describing people.